You know what time it is – it‘s Dame 4 time baby! There are not enough words to describe this stunning job that adidas together with my boy D. Lillard have been doing since the day one. So much respect for both sides. They’re on the mission to create the best possible hoop shoe for those who can’t afford $200 sneakers. So without further ado, let’s dive into the Dame 4 performance review! So the mesh upper continues to rock alongside the all Dame releases and the Dame 4 isn’t an exception. On paper, the she does look nothing new from the Dame 3 as far as the upper go, but different implementation of mesh material and neoprene duo is what makes it for a whole different experience. The upper feels much improved – way softer than on the 3, no break-in time is needed and straight out of box comfort is what you’re getting from these bad boys. Alongside of it, we do have this wire webbing implemented straight into the Mesh. Something similar to the Kobe 11’s Flyknit & wire tooling, but way different results since this mesh & wire webbing stuff doesn’t compromise comfort even a bit. While foot containment is something that does feel improved from the last year’s pair. Going straight to the point, this BOUNCE setup does feel significantly lower, which is a good thing since last year I did feel a little bit clunky due to SUPER “fat” midsole. 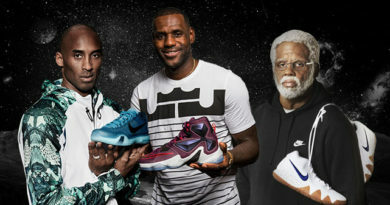 But now it’s a whole different story… Adidas is making some notes. We already received pretty crazy traction patterns this year. But man… The Dame 4 just took that to another level by introducing this wavy tread pattern, which does look to me like tiger scratches. I would call it – “tiger attack”. But in the reality, this pattern symbolizes the flow of time. Some really deep sh*t.
Anyway, this wildly looking traction has some beef to hold you on any type of court & in any type of situation. And if the weather is looking nice outside, outdoor surfaces shouldn’t be a problem as well. However, dust was something that I didn’t expect to be a problem for them at all since the outsole has really widely-spaced grip, but these small gaps in between each thread was a perfect environment for dust to collect. That being the case, frequent wiping is required to keep that solid bite. Let me first talk about that Neoprene goodness. This stuff is straight up heaven for your feet & ankles, I’m telling you. Y’all sleeping on this, man. Everybody is just talking about BOOST and Primeknit. Yeah… I get it. BOOST is life & Primeknit is just another reason why adidas is now sitting on top. BUT how about Neoprene, huh? This spandex like material was so freaking amazing on the Crazy Explosive ’16 that I was having a pretty hard time deciding which Primeknit or Neoprene version was better. And now the Dame 4… Comfy tongue area, easy- access ankle extension which does feel like compressive gear for your ankles & contained heel section for solid lockdown. So if you own a pair of Dame 3’s, just simply go with the same size as they do fit pretty much identical. If this isn’t the case for you then go half a size down if you have a regular/narrow foot or stay true to size if you’re a wide footer. Despite the shoe’s completely redesigned silhouette, the main support core stayed the same making it a one hell of a supportive sneaker. 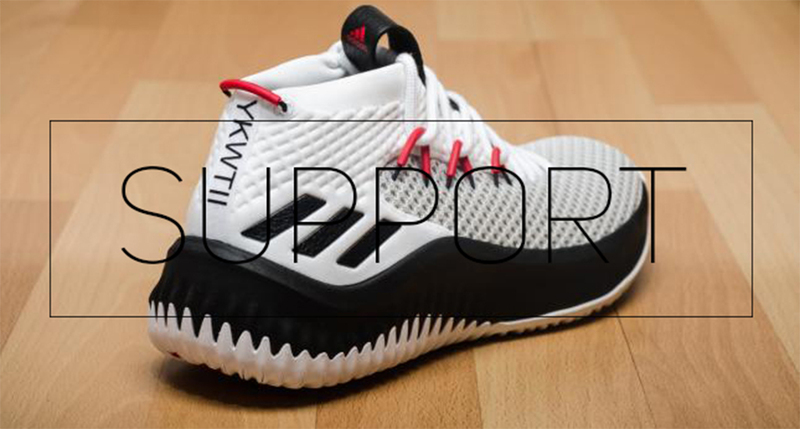 There’s nowhere to find fancy support tech as many other signature shoes do have these days, but you really don’t need them to feel completely secure & contained on the court. Remember, if it has a fancy name and a bank breaking price tag, it doesn’t mean you’re gonna get something spectacular or more than it’s possible. Now, the midfoot and heel sections do have these midsole extensions that keep your foot locked-in & stable throughout the game. While the new lacing system alongside with the ankle collar helps to obtain that perfect one-to-one fit. Just make sure you get the right size and you will be golden. What can I say, man. Just another phenomenal year for the Dame line, finding the ways to improve every single aspect of the shoe upon everything has been done in the past. Although this is only the fourth generation of this line but for now, this is the most stable & most improving signature line for adidas, in my opinion. Everything about this shoe is solid and much improved form the last year – a lighter construction doesn’t hold you back, awesome material duo offers really nice sock like fit & solid foot containment as well, while the BOUNCE midsole pared up with that crazy looking traction will ensure robust grip with the floor and well-balanced ride for any type of player. 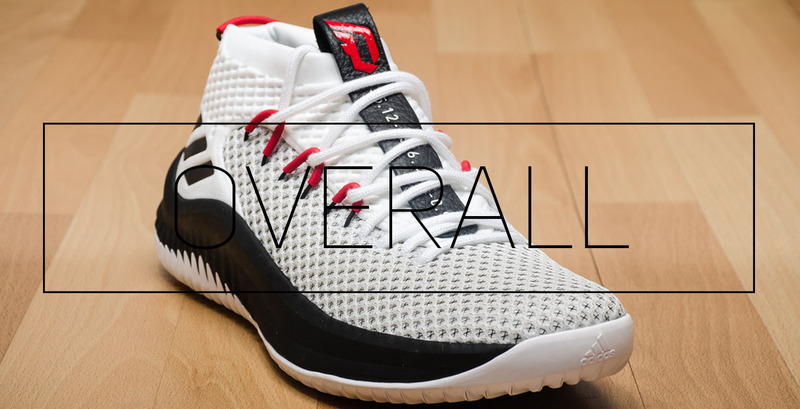 And as a cherry on top, the whole shoe is stacked up with signature Damian Lillard details that pay homage to Dame’s growing legacy, which makes me feel like I’m actually holding a true signature sneaker in my hand. And that is something that I’m missing on today’s signature shoes. 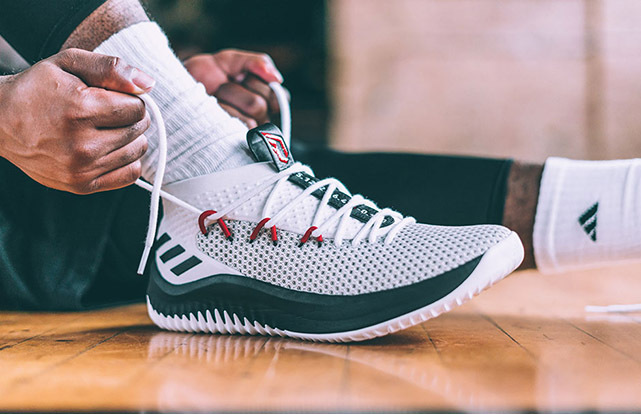 Hope you enjoyed my Performance Review on the ADIDAS DAME 4. Will you be picking them up? Let me know! Dude ur saying that the outsole for the Dame 4 is durable enough for outdoor use? I was being torn between Crazy Explosive 2017 Primeknit and Dame 4 when choosing new pair of sneakers, and went for CE2017P. But despite being happy with them, I feel longing for Dame 4 as well, so I decided to copy Donovan Mitchell, Jaylen Brown and other big boys and own both of those pairs (the more sneakers you have, the better you play, right?). Of course, your stellar reviews and being non-Nike (you can hardly ever find me on the side of the majority, on any given subject) also helped. Plus, I probably need something suitable for outdoor courts. I have a question about sizing and fit. At first I thought that Dame 4 is wide-footer friendly, and I should go for the same size as I did with CE (which I had to break in seriously: thanks to Primeknit for making it possible), hoping that at the same sole length Dame 4 will be more roomy and require less breaking in. > go half a size down if you have a regular/narrow foot or stay true to size if you’re a wide footer. 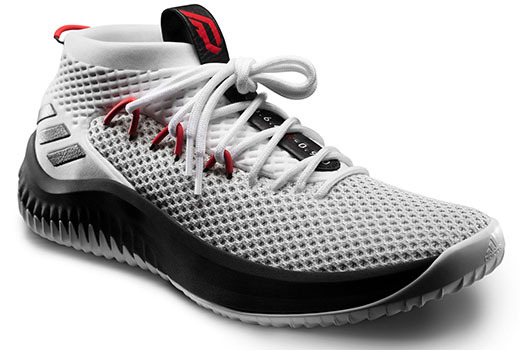 But this sounds like Dame 4 are not any wider/roomier, but they rather run about ½ size bigger than other sneakers. Otherwise narrow-footers would run into issues with ½ size less sneakers being too short. What’s your advice for a guy with CE 44½? =) Or will you recommend spending a bit more time/money to have them tried on before actual buying? Not sure if that improves your game, but I’m 100% sure that the more sneakers you have, the more you want new ones at the point where you don’t even know where the hell to put that sneaker box anymore. Crazy right? Back to the main point, I really dig your thinking by leaving the CE 18’s for indoor hooping (where they should be), while picking up the Dame 4’s to play outdoors (cuz they definitely do own way more durable rubber). Now talking about adidas’ sportswear sizing it’s always a tough call to make, so I would highly recommend you to try them on before buying. Still, I feel like a size 44 is the way to go for you. Got you, thanks for advice. I’ll order 44 and 44.5 (to try them on and return worse-fitting pair). Will write back after jumping some hoops in them! No problem bro. Looking forward to hearing from you soon! At the moment, they cost about €110 here in Russia, with a friend’s discount I was able to steal them at about €87 in official adidas webstore (with door-too-door delivery and fitting!). Performance-wise, I couldn’t be happier: they grip the court, helping me to break some ankles (I suddenly discovered that I can), cushion me on the way down, push me up me to grab the boards, didn’t let me down once (about 4 hours playing so far)! All this while fitting me like a sock and supporting my feet perfectly (oh, and looking cool, of course!). Totally agree with your grades for this model, I honestly don’t know which pair I like more, Dame 4 or CE’17, and I don’t regret buying either one. One minor gripe with CE’17: it’s a real PITA for me to get them on without a shoehorn (no such problem with Dames, thanks to heel loop!). 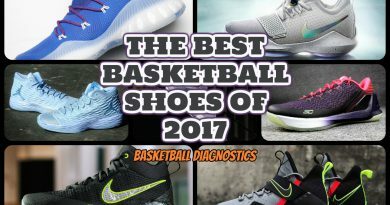 Who said that ball sneakers can’t make you play better? The Dame 4 adds +15 handles confirmed! Hey man, enjoy your new purchase. 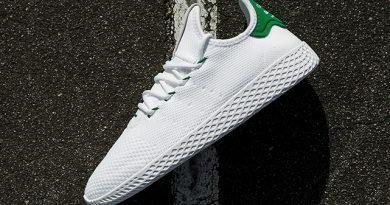 Saw these in a thumbnail and thought they were Krispy Kreme shoes!